Obtaining a good Hypoglycemia diagnosis can be tricky. These include: 1) A Glucose Tolerance Test. Each method has its advantages and disadvantages, however due to the fact that many qualified practioners do not actually recognise the condition as a legitimate one, many sufferers are becoming more and more reliant on self diagnosis and self treatment. This was my own experience and one of my main motivations for writing my own ebook and designing this website. You may have to diagnose yourself! In my Ebook I go into detail, about each of the ways you can determine whether or not you have the condition outlining the pros and cons of each method. By answering a few questions it is possible to determine if you might be suffering from the condition. Below is an example of some of the questions found in the Overcoming Hypoglycemic ebook. These questions should begin to give you some sort of idea whether or not you might be a sufferer. Are you hungry sometimes straight after eating? Do you feel inexplicably depressed? Do you often wake up in the middle of the night and are unable to get back to sleep? Does your mind race with the thoughts of the day as you lie in bed? Do you find it very difficult to concentrate for very long, tasks such as reading a book are very difficult for you? Diagnosis should be based on how you feel! Now it is of course not possible to determine whether or not you are hypoglycemic simply by answering 7 simple questions about the condition, a reliable hypoglycemia diagnosis is in reality much more detailed that that, however if you can identify with any of these symptoms then hypoglycemia could be the cause. There are various things that you can do if you feel that you may be hypoglycemic but the main thing is to begin making gradual changes in your diet. Taking the correct supplements to aid your recovery. As a sufferer myself I can fully understand the need for detailed easy to follow information for sufferers including ways to obtain a good hypoglycemia diagnosis, which is why I decided to research and write my own book in order to help others avoid the same problems I faced when trying to overcome my condition. I truly believe that this ebook will help anyone suffering from the condition or any of any of its effects. 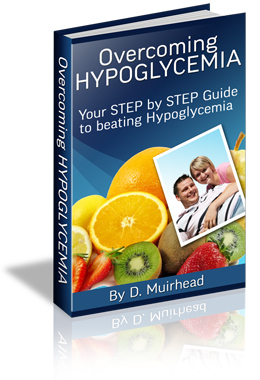 Get a thorough Hypoglycemia diagnosis here today!